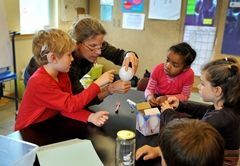 As a progressive school, FCS focuses on educating the whole child: socially, emotionally, intellectually, spiritually, creatively, and physically. 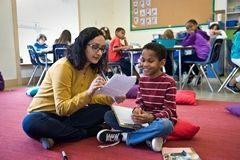 Students are supported in a multitude of ways in their learning journey from mastery of basic skills to higher-order thinking. Curricula and instruction are informed by current thinking and research in education as well as the vast experience of our faculty and staff. 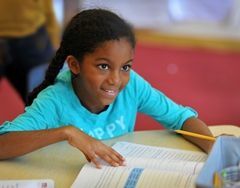 In both the FCS Lower School and Middle School, we focus on fostering individual student responsibility and choice-making throughout the academic and social-emotional programs. Show emotional and social maturity in their choices. Vs. Learning is linear, with factual accumulation and skill mastery. Excerpted from table by Robert G. Peters, with thanks to the books Schools of Quality, by John Jay Bonstingl, and In Search of Understanding: The Case for Constructivist Classrooms, by Martin C. Brooks and Jacqueline Grennon. Vs. School is a task to be endured. Vs. Teachers are sources of information and authority.